When I began homeschooling, our mornings were extremely structured. I had no earthly idea what to expect, really, y supongo que in my head I was envisioning a classroom-like setting, only at home. Now that our first school year has ended, I can’t get over how much has changed. I am a pretty flexible person, and it didn’t take long to figure out what did and didn’t work. As I have become more comfortable with homeschooling, I have been able to experiment, explore and branch out. Our lessons are more relaxed and creative. The same will be true for you. As your child gets older, it will be important to keep careful track of your lessons, not only for memory’s sake, but also to review and – more importantly – to keep track for your state’s laws. Each state is different, but most (if not all) require a record of your work. I also think it is important to keep a record of your progress because it is something tangible that you and your child can look over at the end of the year and see how far you’ve come. I think this is terribly important for boosting not only your child’s self-confidence as a student, but yours as a teacher. It’s also very helpful to settle your mind and help you teach more effectively, especially if you are not following a strict curriculum. 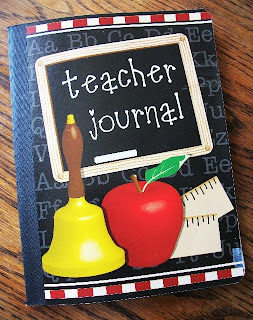 Being organized in this small way will help your schooling to flow more smoothly, allowing for balance and routine. There are a variety of tienditas on-line selling cutesy lesson plan books, and you may even find some you like at your local teacher supply store or homeschool shop. Ooops! Did I say “cutesy”? Don’t get me wrong, I could just have easily picked up a plain spiral notebook at the grocery store and it would have worked fine. Or you might just try a simple binder with sheets of paper that you can remove or add to or rearrange. The structure of your lesson plans will depend on the homeschool method that you are using to teach your child. Try to keep it as simple as possible. Before you write or plan it, ask yourself: Do we need this? If not, leave it out. This is what works for me: I spend Sunday nights preparing for the coming week. 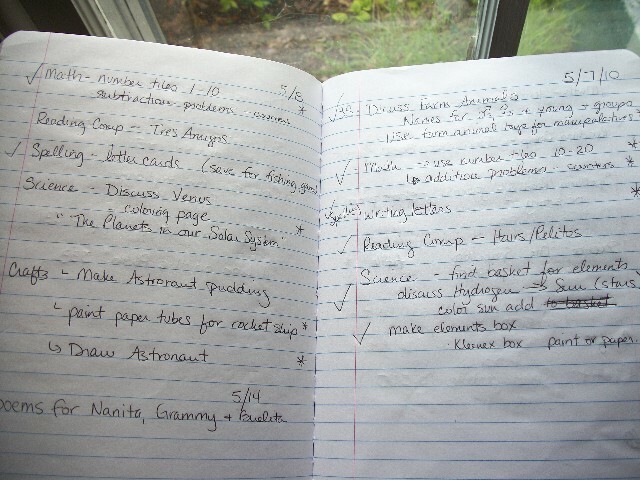 I sit down and try to plan for no more than 4 or 5 topics each school day. Some days we get through all of them, some days we don’t. Since my child is in Kindergarten/1st grade and is a kinesthetic learner, I try to focus primarily on hands-on activities to keep it "fun” and engage her senses. I am also sure to include at least one book per lesson and one cultural activity, though sometimes these are one in the same. During the lesson (or afterwards), I just make a little check mark in the margin so that I know what we’ve finished and if I still need to go back and cover something the next time. Those little asterisks in the right margins are to indicate activities that are primarily independent or hands-on, so that I can make sure my child is not zoning out on a worksheet or mindless work. If something doesn’t work out for my child (she gets frustrated, bored, etc. ), then I circle it. I want to know what my child is having trouble with so that I know how to approach it differently if need be, or what simply needs repetition. Finally, I leave room at the bottom for notes or to make last minute changes. Your lesson plan book should be different, designed around the style that works for you and your child. Just don’t forget to KEEP IT SIMPLE!!! Or, if you'd prefer to keep track of your lessons on-line, check out Homeschool Skedtrack, which is a FREE online lesson planner, scheduler, and tracking system rolled into one. This is an incredible tool that is accessible from anywhere in the world. It comes with video tutorials and screen shots. How do you keep track of your lessons? Anything I missed?